Main material: Pine Wood, MDF, Stainless Steel. Detailed instructions supplied. Type: 1 Drawers 1 Door 3 Shelves. Overall size: 80W x 47D x 92cmH. Woodluv 100% Organic Full Willow Full Antique Washed Corner Laundry Basket with. Can also be used as a serving trolley, room service, carving or care trolley. A simple and elegant 3 Tier Serving Trolley in Bamboo. 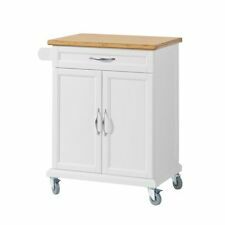 White Wooden MDF & Bamboo Kitchen Trolley Island Dining Cart Worktop Basket. This Robert Dyas Kitchen Trolley features a ceramic tiled-top for protection from heat and spills. Hardwearing heat-proof ceramic tiles – Makes a versatile preparation and serving surface. Ceramic tile work/serving surface. ALL RIGHT RESERVED. It can be perfectly used as a dining table or bar table if you sit at the back of the trolley. Good looking as well as multifunctional. With 4 casters (2 casters with brake function), you can move the trolley around your kitchen easily. ALL RIGHT RESERVED. Extendable worktop, 1 drawer, 2 towel racks, 1 cupboard, 4 rubber wheels and 2 with brake. Unfolding the two boards to lengthen the worktop, which can be perfectly used as a dining table or bar table. 1 X Wood Kitchen Trolley. Main Material: Pine Wood. Drawer Size: 29 X 28 Cm. Two Pull Out Shelves. Wire Basket Size: 28 X 29 Cm. Pull Out Shelves Size: 31.5 X 31.5 Cm. Smart And Compact Design That Allows For Easy Storage. ALL RIGHT RESERVED. This modern extraordinary kitchen trolley is designed for various storage space and durable usage. 4 castors hide into the bottom of the cabinet. They are invisible from outside. Do not miss our Wooden Trolley Kitchen Storage! ThisWooden Trolley Kitchen Storage features a ceramic tiled-top for protection from heat and spills. 4 plastic castor wheels. Kitchen Trolly. Condition is Used. Collection in person only. Solid wood Kitchen Trolley. Smooth Rolling Nylon Wheels. Wire Basket and Cabinet. Steel basket and cabinet. With Drawers，Wine rack. We have high-quality products and high-quality services, we will be happy to serve you! ALL RIGHT RESERVED. With large worktop, 1 draw and 1 small cabinet with 2 doors, 4 wheels and two of them are equipped with a brake. Color: Nature worktop and white body. Load capacity of up to 30kg. 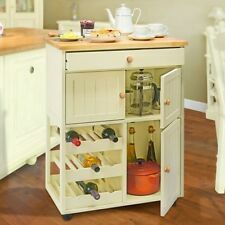 Country Kitchen Pantry Cupboard Storage Unit Island Veg Baskets Wooden Work Top. Condition is Used. Added a couple more pics of this, to show wear on top & fading at side Kitchen cupboard is 70cm wide, 50cm deep and 86cm high. 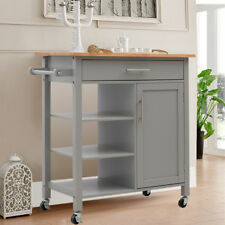 This highly practical wooden effect kitchen trolley has a natural wood worktop combined with the MDF. Perfect for any kitchen because it increases storage with its three-tier storage tables and drawer. ALL RIGHT RESERVED. 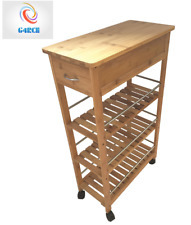 Space saving solid wood kitchen trolley, suitable for indoor and outdoor use. Size: L80 x W40 x H90cm; Material: Rubber wood; Color/Finish: Nature/varnished. Mounted on four sturdy casters and two of them are equipped with a brake. These Freestanding Kitchen Island Units are ideal for creating an extra workspace or storage. Designed to be functional as a preparation table with ample storage in the spaces below. It features a stainless steel work top for preparing foods or for placing your kitchen essentials. ALL RIGHT RESERVED. Practical and space saving. Perfect for the microwave and other kitchen appliances. The cabinet can be mounted on the top, middle or bottom as you like. Self-assembly required. (We believe that good communications will solve the problem,hope for your kind understanding between us: ). 1 X Wood Kitchen Trolley. Two Drawers. Main Material: Pine Wood. Two Pull Out Shelves. Pull Out Shelves Size: 31.5 X 31.5 cm. Smart And Compact Design That Allows For Easy Storage. Top Surface Size: 67 X 37 cm. 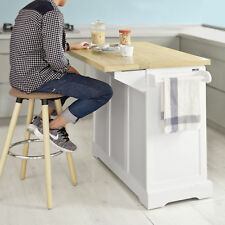 Kitchen island with solid oak worktop comes with 6 stools cream and oak!!!! 1200mm unit with shelf underneath the oak top with over hang for stools to tuck under!!! In very good used condition only had it 18 months and changed mind!!!! Sturdy and durable kitchen trolley. 1 × Kitchen Trolley. Ideal for adding extra counter space to your kitchen. Easy to move with 4 casters, 2 of the casters are lockable to stop moving. Material: MDF,rubberwood. 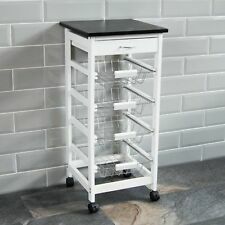 Awesome kitchen trolley, new kitchen forces sale as it doesn't fit, very good condition, tiny marks in the legs shown in the pictures, collection only. 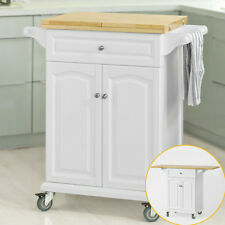 This Modern White Wooden Kitchen Trolley has a Draw, Shelves and Wine Rack, ideal for a small space. The top is tiled. There are wheels for easy maneuverability around your kitchen. Can be used with or without wheels. Has been sued in a craft room so a few paint and glue splashes here and there (see pics) - I am sure they would clean off with a bit of effort. Otherwise in good condition. ALL RIGHT RESERVED. With 1 worktop, 1 drawer, 1 cupboard, 3 storage shelves, 1 towel rail, 4 wheels and 2 with brake. High quality serving trolley in large storage space and strong stability. Detailed instructions supplied. The unit can be also moved around on 4 omni directional wheels making it easy for you to use as an island for the kitchen or as an extra workspace on the side. This will be a great helper when working in the kitchen. Industrial appeal Durable and sturdy On castors Storage solution Ideal for contemporary décor Dimensions (W x D x H): 91 x 43 x 80cm . 3 Pyrex glass dishes (1.5 cubic litres each) included with the trolley. Help keep your food at the right temperature and to bring out the flavours. Silver finish. Removable dish holders - if you prefer you can remove the dish holder provided and use your own serving set.